What happens when your name makes Santa's Naughty List? Little James eyes opened wide. Today was the day. Finally, it had come. A large smile was beginning to form on his face. It started as a small silly grin then it began to stretch and widen as teeth began to poke threw. He sat straight up in his small bed and pushed the warm covers to the side. His feet hit the icy floor as he stood and ran towards the only window in his room. It was a winter wonderland outside the glass window. The white magical snow covered everything he could see. The trees were all bent low under the weight of all the powder and yet it still poured from the heavens. James' warm breath began to fog the window until he couldnt see threw the glass anymore. It was Christmas morning. That one day of the year were a childs hopes and dreams could come true. It was the time where even the meanest people seemed to be not so mean. A time filled with joy as people scurried about from store to store trying to find the perfect gift for the ones they loved. The days were filled with egg nog, friendly chatter and warm hearths. Every window glowed with all the wonderfull colors of decorated Christmas trees. To James, this was the perfect time of year. As he hurried to find his slippers, James could hear the soft sound of old Christmas carols coming from the old radio they kept downstairs. He paused for a moment, savoring every note that touched his ears. After finding his second Elmo slipper, James threw open his door and raced down the stairs into the living room. As he went down the first few steps, he wondered if Santa had brought him everything he had asked for. He knew, of course, that that it was his parents and not and old man in a sleigh who provided all the amazing gifts every year. After all, he was almost ten years old but still deep inside he would pretend for just one day that there really was such a thing elves and magical flying reindeer and that his name was on a list of good boys and girls. It brought everything about Christmas all together into one great, big, magicall day. James entered the living room and the sight brought a small tear to his eye. A warm fire burned bright in the rooms center. Stockings filled to overflowing were hung neatly over the hearth. In the corner stood the most beautifull tree he has ever seen. Lights and tinsel were wrapped all around the green branches. Sparkling ornaments were carefull arranged on the end of the trees branches as if each one had its own story. A lonely star shined from the top of this magestic tree. James could'nt speak, could'nt move. Beneath the tree were dozens of neatly wrapped gifts. Some big, some small. Each one more amazing than the last. He noticed and especially interesting one that was long and thin. He had begged his mother to allow him such a dangerous toy now that he was getting so old but she frowned upon the idea. Could it be? In his mind, he knew which ones would be first and which would be last. He shook in his red and green striped pagamas with excitement. He was about to dive right in and start tearing away at the colorfull wrapping paper when he realized something wasnt right. Where were his parent? His father would usually be kneeling on the stones by the fire, feeding it the dry tinder it needed to stay alive. He would always turn to James, pull down his eyeglasses, smile and say, "Morning, looks like you have been a good boy this year. Either that or you just have Santa fooled." And then his mother would come from the kitchen with her hair tyed back and the remnants of Christmas dinner preparations covering her apron and she would always make him wait while she grabbed the family camera. Maybe they were in the kitchen, he thought. Or maybe still in bed? This had never happened before. They had always been up before him, sometimes hours before him. James decided he had better go see if he could find them before opening any of the gifts. With one longing look at the large pile of presents, he turned and headed towards his parents bedroom. James knocked on the bedroom door. Twice. Three Times. He turned the nob and pushed open the door. The room looked like it always did. Bed perfectly made corners tucked. Wardrobe pollished and vanity arranged neatly. His mother called herself the "Greatest Housekeeper in the World" and it showed. Everything had a place and her bedroom was no exception. "Mom? Dad?, he asked loudly. After not recieving any reply, James took one last look around then he shut the door and turned and headed to the kitchen. The kitchen looked was as neat as the bedroom. Polished pots and pans hung over the stove. The magnet covered refrigerator hummed in the corner. Everything had a place and it was all neatly organized. Counters, floors and walls were so so clean, they shined. But still no parents. James could feel his heart start to race. Panic began to set in as he started yelling their names louder and louder. He ran from room to room then upstairs repeating the process. After still not hearing any reply, he wondered if maybe they were outside. After all, it was snowing hard out there, maybe they needed to shovel or something. A flash of hope calmed him slightly as he raced to his room and quickly put on his thick coat and winter boots. Back downstair fully suited up for the freezing weather outside, James opened his front door and stepped out into the blinding snowfall. He could not see a thing. The thick snow came down so hard and fast that it was hard to make out his own hand. Carefully, he stepped down the steps and into the blizzard all the while he was yelling for his parents as loud as he could. The snow had not been shoveled recently and was as high as his knees. It took all the strength he had to just move a few feet. The downfall started to slow but only just a bit. James was able to see a little farther but not much. He rounded the corner of his house and could see the small shed his father used to store tools and equipment. He noticed the door was wide open and the small glow of a light was visible threw the opening. He trudged threw the thick web of white and finally reached the wooden shed. He stepped into the shed and slowly his eyes adjusted to the single dim bulb swinging in the room. As the room came into focus, James dropped to his knees at what he saw. He couldnt move. He couldnt breathe. He couldnt yell. He could only stare in shock at the sight before him. His father lay montionless, eyes and mouth opened on the large worktable on the far side of the room. Blood dripped in streams from his body to the floor. A large pool was beginning to form around the base of the table. He could see a large garden tool lodged deep into his father's skull. James turned away as he heard the muffled cries of his mother coming from the other side of the room. He saw a small figure hovering over his mother with his back turned to him. It wore a large, black, hooded trenchcoat that hung to the floor. James could see his mothers legs and arms twitching and shaking on each side of the figure as It muttered strange things and repeatedly sliced her with something in its hands. She too was covered in most of her own blood, the rest drained down toward his father's and it mixed together into a dark, red pool. James was still frozen in shock. He tried to move. He tried to yell but only a small squeak came out of his mouth. The figure stopped at the sound and dropped, what looked like, a boxcutter to the ground. It straightend Itself and stood as tall as It could never letting James see anything but It's back. "Jamsey boy, I wondered if you'd come," the figure spoke but it was the voice of an old woman who had smoked two packs a day her whole life It spoke as if each word caused much pain to say. "Your parents were very naughty this year, Jamsey," the thing screeched. "They've done some terrible things and now...."It paused then chuckled," Well now they have to pay". The Thing lifted its hand and James felt the door slam behind him. He pushed away on the ground and slid backwards until his back hit the closed door. He looked quickly to his dead father and then to his dying mother and back to the black figure. "Wha...what have you..you done"? James tried to ask but he could barely breathe long enough to mouth words. The figure didnt reply. It took a step backwards then stopped. "Did you see all those presents there Jamsey? Those are because you were on the Nice list my boy. You've been a good boy but your mom and dad, they weren't as nice as you were." It paused but only for a moment. "Despite typical beliefs, The List is for both children and their parents. Have you ever wondered what happens to the people that make the naughty list"? It started to chuckle and then it snapped It's head around to face the boy. "Well thats where I come in." James couldnt believe what he was seeing. It had turned to face him and when It did, the black hood fell off to the side. Its head was round and dirty white with burning coals for eyes. It's nose was an old crooked carrot that pointed in an odd direction. It's hideous smile was filled with jagged, sharp teeth. The rest of It's body was covered in black garments but he could see now that they were ripped and torn and stained in blood. It's fiery eyes stared into James' soul. 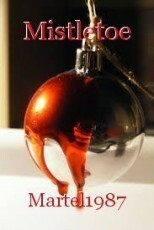 "They call me Mistletoe and I'm what happens if you make the naughty list." © Copyright 2019 Martel1987. All rights reserved.